Samdech Akka Moha Sena Padei Techo Hun Sen, Prime Minister of the Kingdom of Cambodia, expressed his optimism that the two proposed laws related to election reform will be approved by the National Assembly (NA). 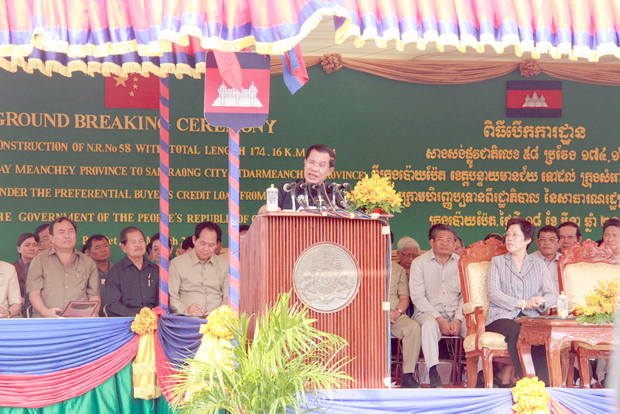 Tomorrow, the NA will endorse the two proposed laws agreed by the two parties – the ruling Cambodian People’s Party (CPP) and the opposition Cambodia National Rescue Party (CNRP), underlined Samdech Techo Hun Sen while presiding over this morning the groundbreaking ceremony for the construction of National Road No. 58 in Banteay Meanchey province. As planned, he added, the new National Election Committee will be created on April 13, 2015. The Proposed Law on Organizing and Functioning of the National Election Committee and the Proposed Law on Election of Members of the National Assembly were tabled for discussion at a consultative workshop jointly organized by CPP and CNRP on Monday at the NA Office with the participation of some 400 participants, including members of the NA and Senate, members of the Royal Government of Cambodia, representatives of civil society organizations and representatives of the Embassies of Sweden, France, Japan, the European Union and Australia. The NA is going to hold on Mar. 19 an extraordinary session under the chairmanship of its President Samdech Akka Moha Ponhea Chakrei Heng Samrin, to debate and approve the two proposed laws.